I find the biggest challenge in garage DIY is getting the car up in the air to work on it. Simple jobs become too much of a struggle otherwise. I'm revisiting the search. Has anyone been down this road and have any experience or recommendations to share? There has been lots of discussion about lifts with varying recommendations. Search is your friend but it boils down to what you have a budget and space for. That one doesn't lift very high. My garage jack will lift either end almost twice as high for a lot less money. I’m looking at these at the moment. I am favouring this type. I like the way that it has clear access down the centre. It is low profile too at 110mm. I’m considering setting it into the floor. I think these are a really good particularly with limited head height but I struggle to see how you'd save working off your back on the floor? Its a 1m max lift. Unless you is tiny that is. Is a 4 poster a better option so at least you can get the full lift? Yes, have been looking closely at that one too. Headroom is the problem for me in a normal garage. One of the reasons why I've been looking at the smaller versions is portability - I could use it on my drive (perhaps!). The downside is the structure between the lifts but being able to use it outside is a definite plus. Current 911:3.2 Carrera Coupe in Guards Red. Strongman do a similar one to that where the cross beam can be removed so you can wheel a trolly in and out up the middle which makes it good for getting engines out. i have this one one but other than testing it once I have never used it. It seems to work well (especially the tilt bit) but does seem awefully precarious! You will lose even more working height . Could this thread be of interest? I agree Phil. Only worth it if it takes the backache out. After waaay too much research and dithering thats the one I bought - seemed to work best for what I needed it for. 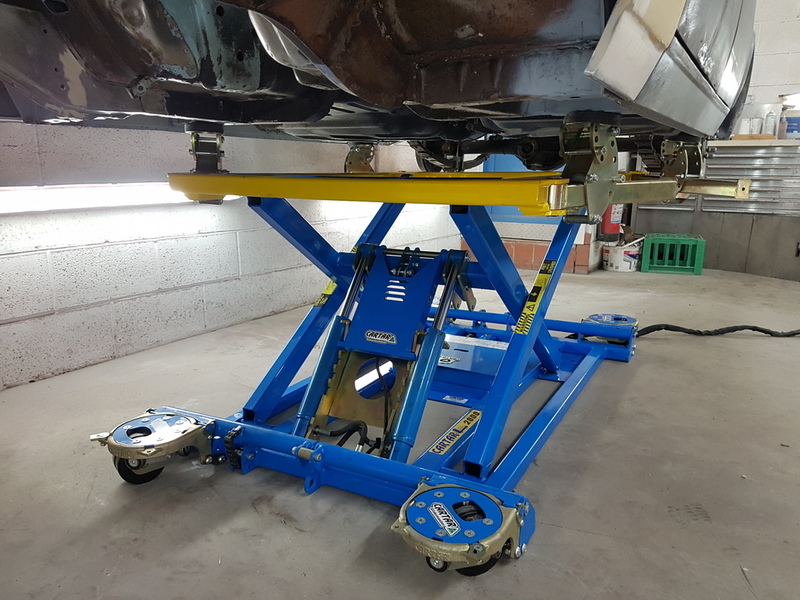 if you are height restricted a 1m lift works ok, wheels come up to standing mid body height, a low st00l puts them at head height and you can work underneath it ok, certainly better than jackstands. 4 posters are friggin hopeless for anything other than alignment - whats the point in lifting the car up in the air but it still being on its wheels with 2 long platforms in the way. 2 posters are also a pain as the 2 posts get in the way so you can never open the doors fully or use it when you want to lean into the car to do work. They often also have a raise before you lower feature to lift off the locks - this means when fitting an engine you cant do micro adjustments as you lift or drop the chassis onto the engine - total PITA! I considered that one too but the crossover bar would get in the way especially when dropping the engine and you want to use an engine trolley. I did think about flipping it round and putting the engine at the other end but the crossover end is the beefy end of the lift so should ideally be under the heavy end of the car. 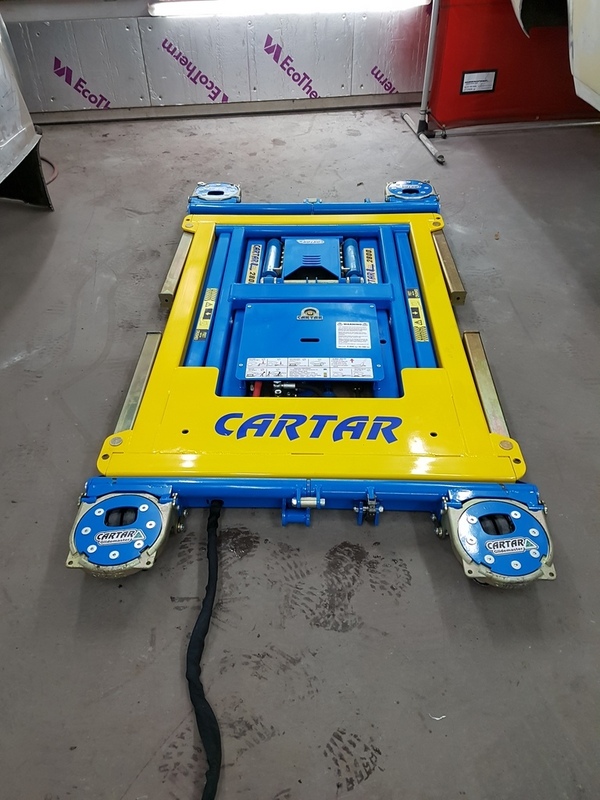 No you wont - you simply place the car where you want it them put rubber / wood blocks between the lift and the lifting points on the car - no lost lift height. The Carter lift looks quite nice but you lose any access to the centre of the car which is my book makes it a non starter. Also the extendable platforms the car actually sit on make me feel uneasy - if you want to any heavy spanner work the last thing you want to be doing is having the car wobble about while you gorilla a breaker bar. The The AS-7532B Mid rise scissor lift really is the best option if you are height limited and want most flexibility over how you will use the lift - sinking it into the floor makes it even better! When I move I will be sinking it into the floor and also extending the hoses so I can put the control plinth a bit further away from the lift. As Jevvy said, just use blocks for a little more height. More importantly, when the lift is down, you'll have a level and clear floor space. No need to find a corner to hide the lift when not needed. I've just picked up one of the BH Repairs scissor lifts (http://bhrepairs.co.uk/) secondhand this week. I'd had an eBay search for a year for one within 15miles and it finally came good. Its a much bigger, heavier bit of kit (450kg!) than the pictures would lead you to think. Getting it out the work's van and down my garden took six of us and methods similar to those they used to build the pyramids! I've got under my 914 and given it a go - it's got plenty of lift height - I'm not planning on going under it when its this high - but glad I built the shed with a high ceiling! I think it'll be more this height whilst I'm working on it - its rock solid on the lift alone, but the axles stand give some extra reassurance! I'm going to have a better look at it this weekend - but initial impressions are it's a great bit of kit and will make engine drops, suspension work etc. a hell of a lot easier. I have limited ceiling height so 1m is my lift limit. @jevvy What’s the size of the control unit? It looks fairly big in the photos but no dimensions are given. I'll put a tape measure on it next time I'm in the garage, pics on the site make it look larger than it is but the plan view in the PDF gives a fairly realistic representation of its size I would say. Thanks Jevvy - that's really useful. Still liking the mobile AS-7530D but as you say it would be a potential challenge for an engine drop. Do you think the cross bars would prevent an engine drop? Two poster no good for me. I do think I am being incredibly naive thinking the Automech AS-7530D could be moved around though - the sheer weight of the thing means it's never going to be mobile. So the preference swings back to the one that Jevvy has, the AS-7532B. I wouldnt say it would prevent an engine drop but perhaps make it a little more awkward as the floor space between the platforms is narrower and you have that linking bar in the way. I actually fitted the platforms of mine slightly wider than the drawings which gives more room down the middle without really causing any issues on the outsides. I also wouldnt class either options as portable - its a bit like building stone henge moving the platforms around as they are firkin heavy but at least with my lift they are independent so you can move one at a time more easily if needed. I havent had to yet but I also thought having the separate platforms would mean I could push them together if a particular job needed less room down the middle and more access round the sides, you could probably lift the car with 1 platform if needed I actually dont use the fold down ends as they are kinda badly placed for the short 911 body and can get in the way - easily removed and I have just build a couple of small ramp / platforms instead which I put to one side when the car is up onto the lift. Also worth noting the 7532B has dual hydraulic rams on each platform and Hydraulic failure safety devices whereas the 7530D has single rams and Pneumatic safety locks which IIRC requires a compressor hookup. The height on mine can be adjusted by the millimetre pretty much. Like many things like this once you buy one you wonder why you hadnt bought one 10 years ago and kick yourself for not doing so. 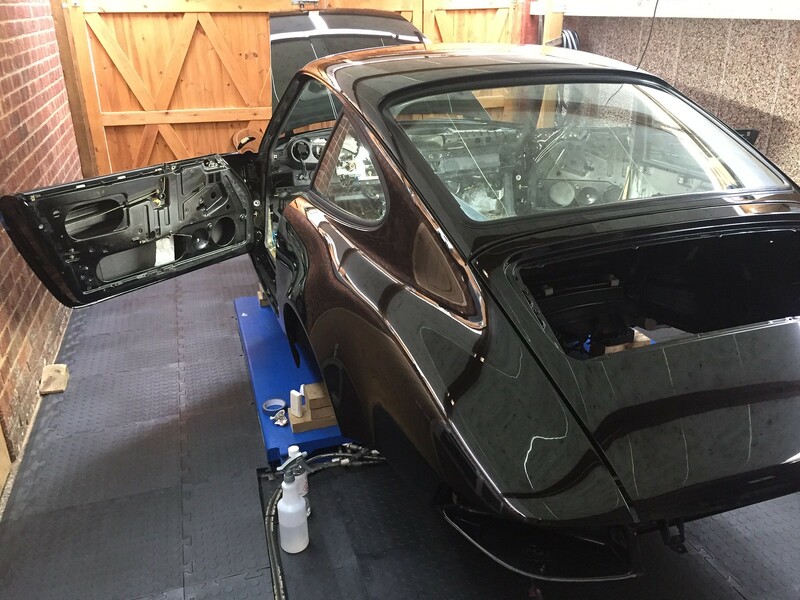 Zero stress and hassle free car lifting really does streamline any garage grafting. Thanks Jevvy. Yep, I am being very naive thinking that the mobile unit is going to be in any way mobile. Have also just discovered the need for an air supply with the 7530 - as you point out. When you bought it was it a reasonably easy two-man job to move the platforms into position?